Gameloft signs on to bring these iconic toys into the video game realm. Few toy lines have had Playmobil's success. Launched in 1974, the company has produced over 2.5 billion figures, a staggering number when you take into account all those forgotten companies and products, the ones that debuted in the 80s and 90s and were never heard from again. 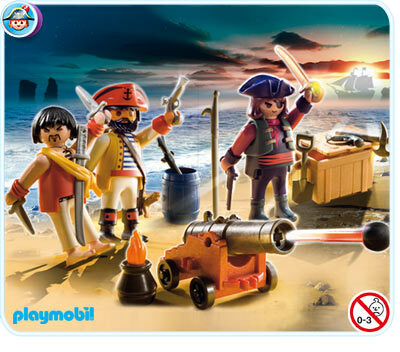 With this in mind, Gameloft made the surprise announcement that it teamed with Playmobil to create the upcoming iOS and Android video game, Playmobil Pirates. Although we don't have screenshots yet, this promising title lets users recruit pirates while completing a variety of quests. "We are thrilled to collaborate with a leader in digital games." said Christian Buchner, Project Manager New Media, from Playmobil. "By featuring our world-famous pirates' toys in an innovative and user-friendly digital game, Gameloft supports us in bringing PLAYMOBIL fans a new, totally immersive gaming experience." "Playmobil is one of the most famous children's brands in the entertainment world and we're excited to be the first publisher to bring these hugely popular toys to life on digital platforms." said Gonzague de Vallois, Vice President of Publishing at Gameloft. "We've put a lot of effort into creating a gaming experience that remains faithful to the fascinating Playmobil universe, from the famous pirate ship to the brand's unique characters." Sounds good so far. Just one thing. It seems Playmobil Pirates will be free-to-play, so expect it to take the same freemium route that's become quite popular on the App Store and Google Play as of late.